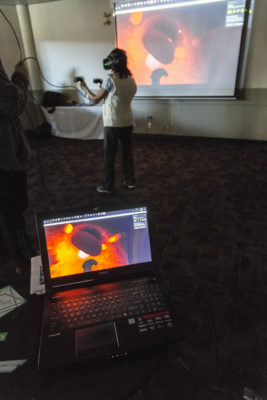 TRU geography professor Michael Mehta hosted an open event last Monday where attendees could personally interact with various virtual reality programs. For Mehta, the applications of virtual reality could significantly enhance the learning experience in higher education, particularly for Open Learning and distance education. Despite his large ambitions, he is taking a pragmatic approach to the challenges ahead before integrating the technology in classrooms. Concerning budgeting costs, Mehta provides a realistic comparison with current computer labs and suggests the idea of a dedicated VR lab. Particularly for trades and technology uses, Mehta describes the broad range of training opportunities available for practices including mechanical repairs, heavy machinery and even mining. Mehta also expressed his enthusiasm for applications relevant to the liberal arts with possibilities of exploring geographical locations, language acquisition or even to relive important moments in history. The event featured a simulation called The Body VR: Journey Inside a Cell, an educational experience that takes the user inside the human body through the perspective of a red blood cell. Nursing Assistant Professor Melba D’Souza had the opportunity to try the simulation and shared her thoughts on its practicality along with some of the time limitations when programming content for the health sciences. The event was hosted with the help of the Faculty of Arts and All Around Gamerz provided HTC Vive headset stations. Virtual reality in teaching is a revolutionary journey and a complexity pedagogy balancing the state of art of knowledge translation viz a viz the current models of inquiry based and experiential learning applied for discovering and creating new knowledge.